Why is it time to leave Exchange 2010? The main reason is that you will not be able to maintain the server up to date. Once Exchange 2010 reaches the end of its lifecycle, it will no longer get security updates, bug fixes and technical support from Microsoft team. This should sound to you like a good reason to start planning your migration to a newer version of Exchange, preferably to Exchange 2019, which is currently the youngest Exchange edition available. Although Microsoft continues its cloud-only strategy, there are still companies which prefer or need to stay on-premises. The reasons for that are mainly security regulations obligating companies to store business data locally. So if you plan to migrate to a newer version of Exchange, it is worth considering moving to the newest (the youngest) available. Exchange 2019 is at the very beginning of its lifecycle, which is vital from the support and maintenance perspective. And as announced on Microsoft Ignite 2018, this is claimed to be the most reliable Exchange version ever. 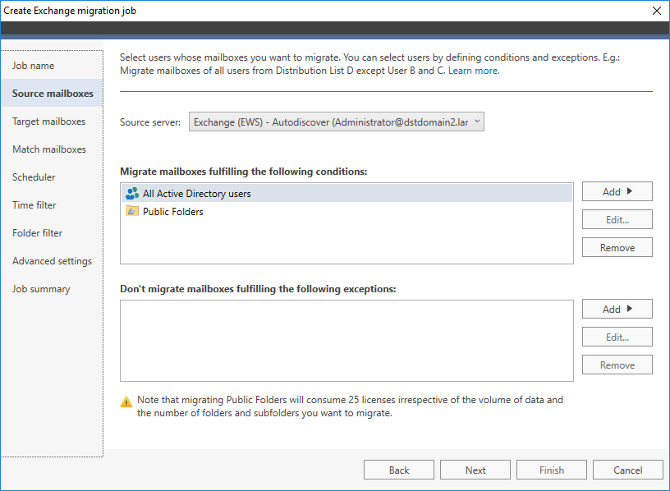 Having this in mind, I will show you how to perform the migration to Exchange 2019 using CodeTwo Exchange Migration. Note: If you look for a way to migrate mailboxes to Office 365, see my other article on migration from Exchange 2010 to Office 365. Why choose CodeTwo Exchange Migration over native migration path? Auto matching source and target mailboxes. And the list does not end here. If you want to see more benefits, follow this link. 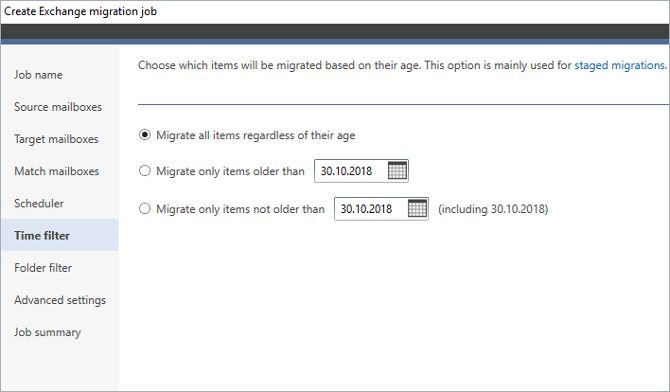 How to migrate to Exchange 2019 using CodeTwo migration tool? It may sound a bit “salesy”, but the fact is that the migration with CodeTwo Exchange Migration will save you a lot of time and effort. 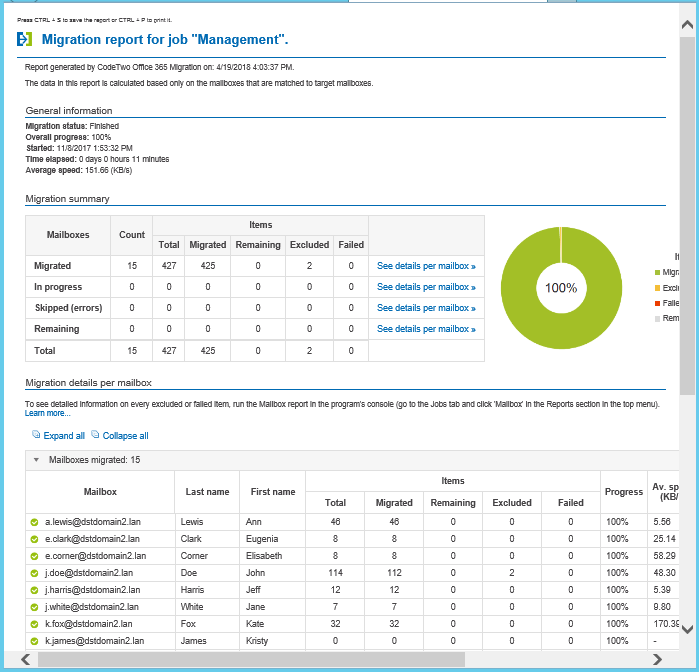 Below you can find a brief overview of how to set up the software and a migration job. Note: You can trial the software at no cost for 30 days and migrate up to 10 items per folder. Click here to download the trial version of CodeTwo Exchange Migration. There is also an option to get a temporary license key allowing you to migrate all items from a limited number of mailboxes. To obtain the special key, contact CodeTwo Customer Service. 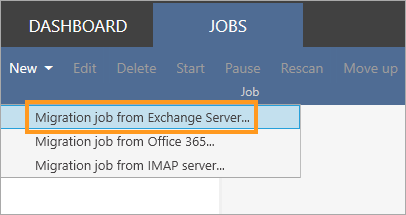 In the Administration Panel of the program in the Jobs tab, click the New button and then Migration job from Exchange Server. 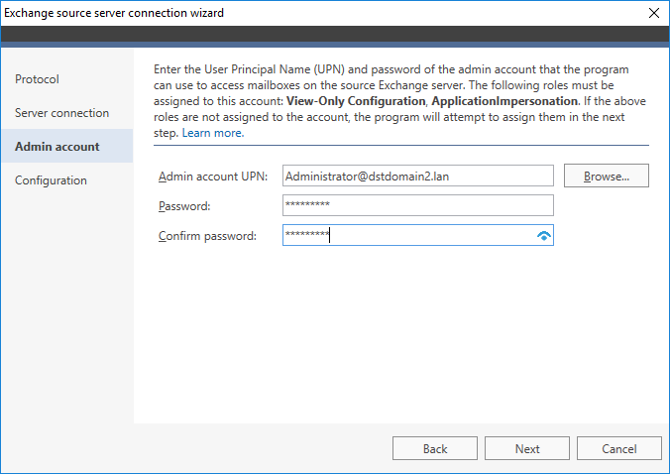 Connect the program to the source server via the easy-to-follow connection wizard. 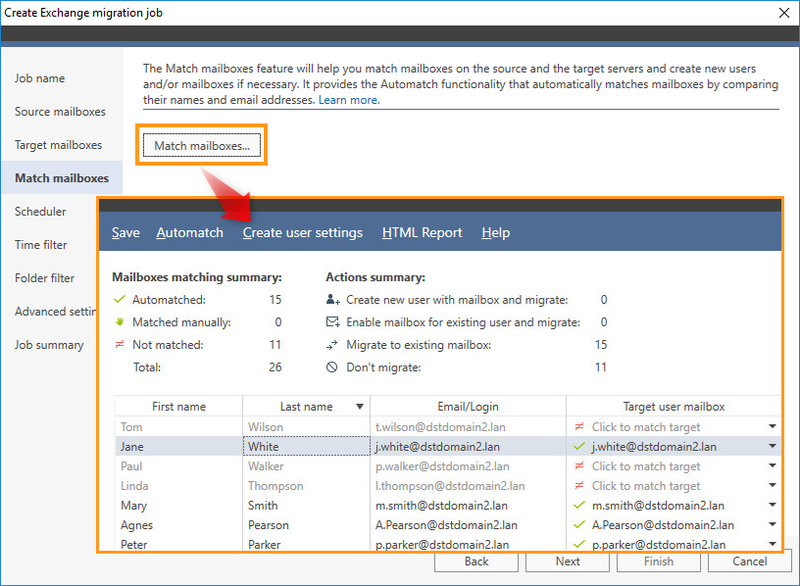 Once the program connects to the source server, select mailboxes for migration. 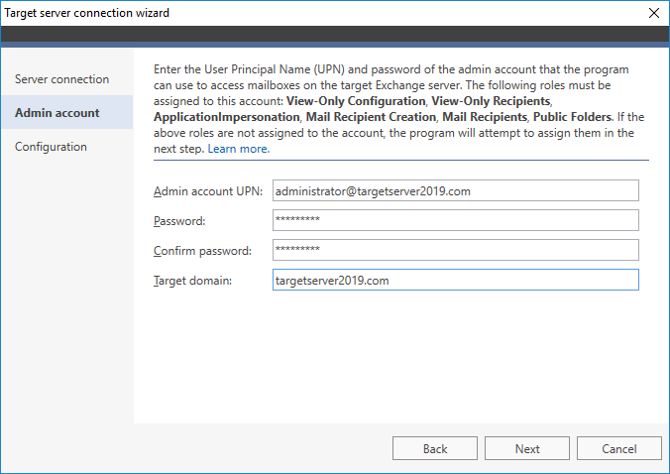 Then, set up the target server connection by following the wizard. Match source and target mailboxes. You can do it manually or let the program match mailboxes automatically. 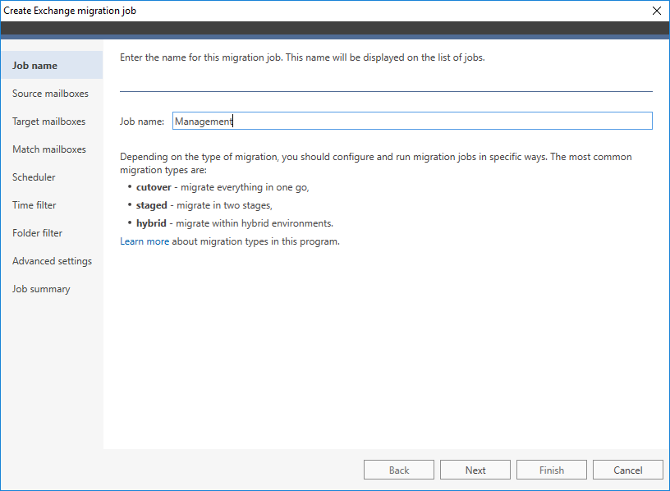 If you want to run the migration job at a different time e.g. 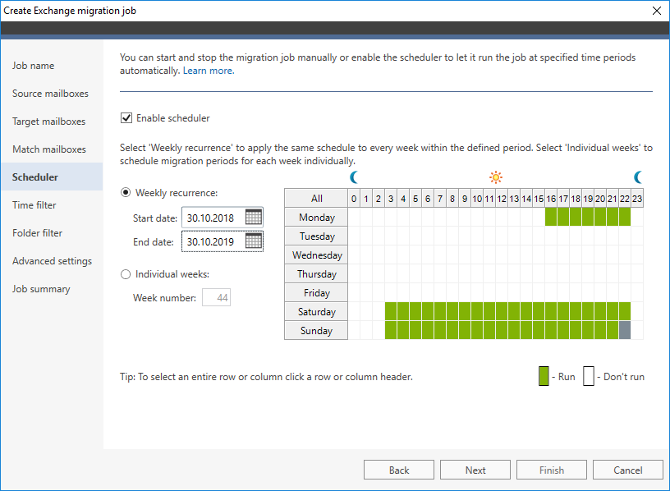 on weekend, you can enable scheduler to activate or stop the job automatically. Choose which folders should be migrated. 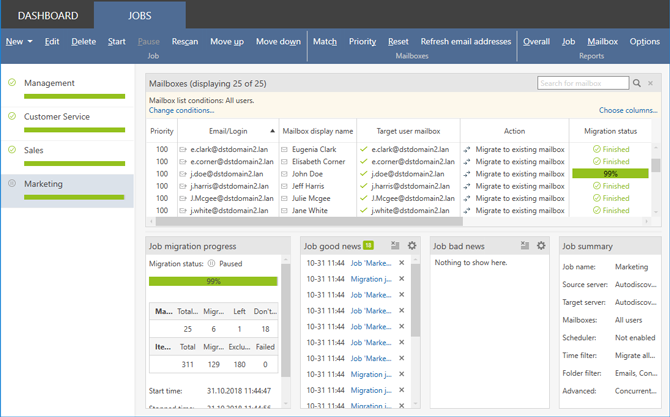 Run the migration job and watch how the magic happens. 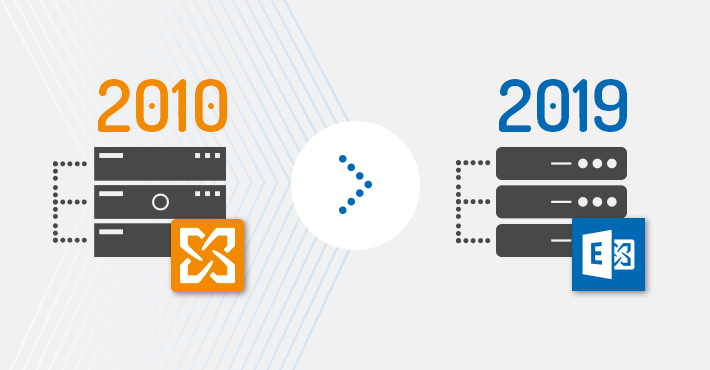 For a full migration walkthrough from Exchange 2010 to Exchange 2019, visit this user’s manual.